It is very important for children to attend school. 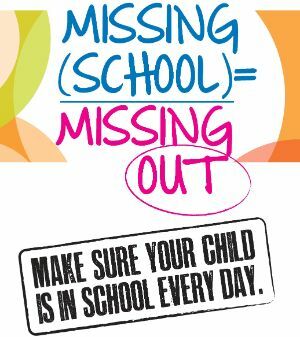 When students are absent, they are missing instruction and may be falling behind their peers. *The state Compulsory Attendance Laws identify 7 valid reasons for excused absences. * Each student may have 6 parent notes. * Illnesses with a doctor's note do not count as one of the 6 (parent note) days. * Students must provide a note within five days from when he/she returns to school. * If a student is sent home from school by the school nurse, it does not count against the parent or require a parent note. * A tardy is any time a child comes in late (after 7:15) or checks out early (prior to 2:20). * Any child who has been absent from school without a valid excuse for 3 days is a truant. * Any child who has been reported as truant two times is a habitual truant.